3.5 stars out of 4 -- "Containing the most exciting racing footage committed to a major motion picture, John Frankenheimer's GRAND PRIX strap you and its international cast into the driver's seat for a furious, adrenaline-fueled Cinerama experience." 3 stars out of 5 -- "[T]he on-track stuff, as you'd expect from John Frankenheimer, is petrolhead heaven." "Formula 1 in all its glory. 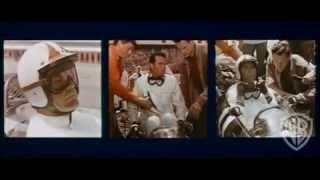 Nothing before or since can match the spectacle of John Frankenheimer's race-car epic..."
Nine races. One champion. James Garner, Yves Montand, Brian Bedford and Antonio Sabato portray Formula I drivers competing to be the best in this slam-you-into-the-driver's-seat tale of speed, spectacle and intertwined personal lives. Eva Marie Saint and Toshiro Mifune also star. John Frankenheimer (who 32 years later would again stomp the pedal to the metal for the car chases of Ronin) directs this winner of 3 Academy Awards, crafting split-screen images to capture the overlapping drama and orchestrating you-are-there POV camerawork to intensify the hard-driving thrills. Nearly 30 top drivers take part in the excitement, so buckle up, movie fans. Race with the best to the head of the pack! GRAND PRIX is John Frankenheimer's film about the nine-leg world championship of Formula 1 auto racing, and stars James Garner as driver Pete Aron. During the opening race in Monaco, a collision sends Pete's car flying into the Monte Carlo harbor, and British driver Scott Stoddard (Brian Bedford) into a wall. While Pete survives unhurt, Scott may lose the use of his legs, and many hold Pete responsible. Jean-Pierre Sarti (Yves Montand), whose marital boredom has led to an affair with fashion editor Louse Frederickson (Eva-Marie Saint), wins the next race at Clermont-Ferrand. Afterwards Pete accepts the sponsorship of Japanese business magnate Izo Yamura (Toshiro Mifune), and begins to romance Stoddard's jaded young wife Pat (Jessica Walter). Pete wins the Belgian leg of the contest, but Sarti goes into a depression after skidding on a wet track and killing two children in a crash. After Pete also takes the German Grand Prix, Stoddard amazingly returns for the Dutch event, and, driving on sheer grit, pulls out a victory. He proves it's no fluke by also winning in Watkins Glen, N.Y. and in Mexico, making the championship competitive once again. Essentially a soap opera interspersed with racing footage, the film's existence was ascribed by Frankenheimer to his fascination with the sport and a desire to spend time in Europe. That said, the racing sequences are still among the most realistic ever put on film, jammed with wide-angle helicopter shots, you-are-there car-mounted cameras, and then-fashionable split-screen sequences. GRAND PRIX is a definitely a film or racing fans. Shooting locations: Monano, Clermont-Ferrand, France, Monza, Italy, Spa-Francorchamps, Belgium, Watkins Glen, N.Y., U.S., and Zandvoort, Netherlands. Crash stunts were executed by firing a given car out of a hydrogen cannon at 125 m.p.h..
Frankenheimer decided to use the split-screen technique after watching its use the recent World Series, and from viewing the visual experiments of Charles Eames. The 70mm car-mounted camera was so heavy that the rear suspension of the car had to be jacked up to accommodate it. Most of the film was shot with 1000mm telephoto lenses. Robert Redford turned down the James Garner part.